I recently competed in a 24hr Yahoo! Hack Day where I designed and developed Glance along with @allenr. With Glance, we wanted to show that you could make great looking web apps that work great in all browsers across desktop and mobile without resorting to CSS Media Queries or User-Agent sniffing, or changing the code at all. 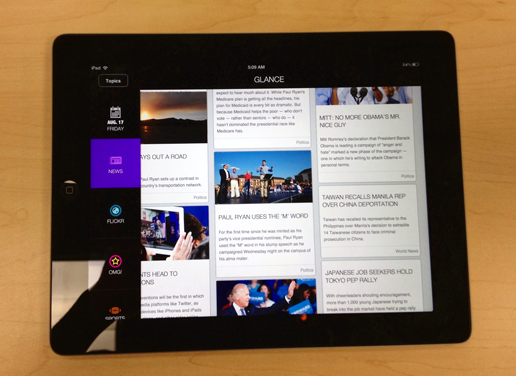 The secret being Glance is Masonry, which dynamically alters the layout based on the screen size. 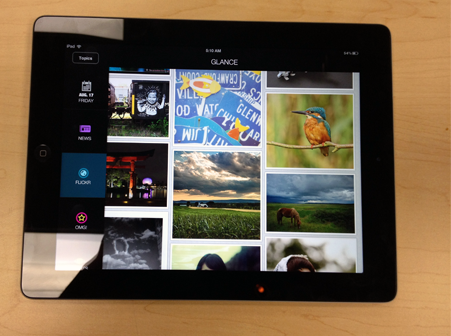 Glance is a client-side app that’s built using YUI. The data is pulled from various sources using YQL and stored before-hand in Parse, for quick access. A NodeJS script is running on Heroku every so often, querying for new data. Check out the screenshots below, and try out Glance in your browser. PPS: Works best in Chrome/Safari, and resize your browser window to watch the content reflow.